You can’t turn around for two seconds without another eats-joint opening in Ballard. Don’t believe me? Go take a stroll and see for yourself. I was hot on the gelato trail this week, intent on paying a visit to D’Ambrosio Gelateria Artigianale where Marco D’Ambrosio (who gave up a career in wine sales) and his papa Enzo (who mastered his craft in Italy) are proud to offer the kind of gelati they adored back home. But I unexpectedly found more than I was looking for. 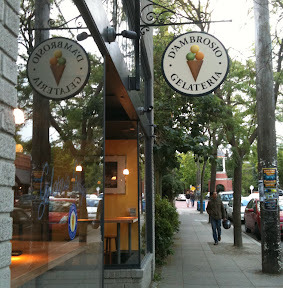 Happy trails to you — in beautiful downtown Bah-lard: D’Ambrosio Gelateria (left) and its across-the-street neighbor, The Noble Fir. Indeed, I went nuts over the D’Ambrosio’s housemade pistacchio di Bronte (among other flavors, including panna cotta and caramello with fichi and mascarpone) and Marco explained why: those pistachios, grown in limited production in Sicily, are the best money can buy. I’m certain the Italians’ philosophy of using carefully sourced ingredients and organics to make their sweet treats had something to do with the delicioso-factor. And I’m coming back soon, fingers crossed, to try their cannoli (the cupboard was bare on my visit), since I’m crazy for that Italian pastry done right, which is hard to come by in these parts. Marco, packing ’em in at his new gelateria at 5339 Ballard Avenue N.W. But before I even got my hands on my compostable gelato cup and spoon, my eyes widened when I saw The Noble Fir, another newbie, planted on the opposite side of the street. And when I waltzed into that handsome wood-accented pub, whose bar is bracketed by a pair of TV screens, I did what I later watched other passersby do: I checked out the food and drink menus resting on the table by the door, the wines lined up on the shelves and the many taps on offer (in addition to a wide world of other beers and ciders). Hard cider on tap? Bring it on, at 5316 Ballard Avenue N.W. Then I made myself at home. Life may well be short, and there are those of you who strongly believe in the old adage “eat dessert first,” but I am not among you. So, settling in to a high table mid-room, I wet my whistle here with a glass of Fox Barrel Black Currant Cider ($5) and indulged in a bite — or three — from the noble, albeit brief, nosh list. That menu allows you to mix-and-match your own meats, fish, cheese and vegan options (yes, they have Field Roast grain meat), and choose three ($9), five ($13) or seven ($17) different snacks to suit your taste and hunger-quotient. 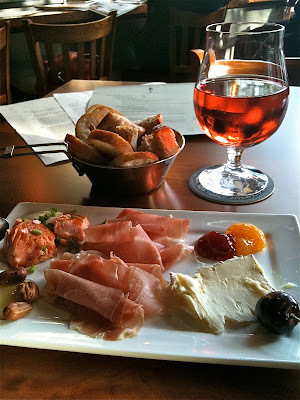 I paid a $2 surcharge for Wilson Fish’s smoked Northwest wild salmon, a farmers market-staple that was well worth it, so this pretty platter, with St. Andre cheese and prosciutto, set me back $11. Hungry? At The Noble Fir, there’s an app for that. I can’t think of another pub quite like this one, notable for its view of Bastille out the big picture windows, Sting on the sound system and a comfortable corner nook all tricked out with a library of hiking books, travel guides and maps for your perusal — a la Rick Steves’ Europe Through the Back Door travel center. Turns out owners Rick Weersing and Ellen Kelly are hard-core outdoorsy types. He spent a decade working for REI (where, I hope, they gave him a discount on the REI camping pot holding my bread, above) and she’s an attorney who could use a drink after 10 years plying the legal trade. As for other legalities: leave the kids at home. The Noble Fir is 21-and-over only. When they’re not tending bar and tables, Rick and Ellen are living the REI lifestyle — God love ’em. So, anybody been to either of these places yet? What did you think? 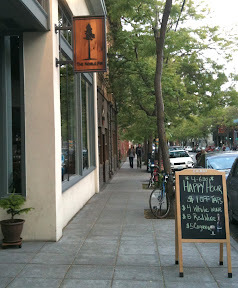 And do stay tuned for more on this particularly delicious stretch in Ballard. Restaurant critic Providence Cicero reviews neighboring Moshi Moshi and this week’s Dining Deal spotlights Jhanjay Vegetarian Thai — both set to post at seattletimes.com later today.